Bio: Ama Karikari-Yawson earned a BA from Harvard University, an MBA from the Wharton School and a JD from the University of Pennsylvania Law School. Her unique understanding of social issues, business, and the law has enabled her to become a relevant voice on issues as varied as diversity, sexual violence, and personal empowerment. She is a frequent contributor to publications such as The Huffington Post and The Atlantic. In 2013, a painful experience with bullying inspired her to write her best-selling fable about difference, Sunne’s Gift. Ms. Yawson became so personally invested in spreading the book’s message of healing and harmony, that she quit her six-figure job as a securities lawyer to become a full-time, author, storyteller, speaker, and edutainer. Her life-changing workshops and training sessions incorporate storytelling, drama, dance, history, cutting-edge psychological research and legal analysis in order to truly propel participants towards healthier and more successful lives. Title: Chae’s Guide Book: How to Be the Best Big Brother or Sister You Can Be! Bio: At just 8 years old, Chae Blount of Laurelton collected the lessons he’s learned from life and published multiple guidebooks for kids just like him. Chae developed advanced reading skills at a very young age, according to his mother, Dianna Blount. She said that he started reading at just 9 months old. Dianna knew her son was special after participating in a spelling bee at only 3 years old. 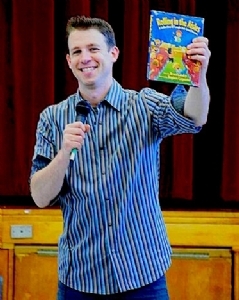 Bio: Joe Guida has become one of Long Island’s top children performers at schools and libraries throughout Nassau and Suffolk counties. His upbeat shows will have the children participating with singing, clapping and dancing from the very first song right through his last rocking song “Dance With Me To My Music”. Bio: Roslyne Johnson is a Social Worker who has practiced for over 25 years. She has held positions in environments such as an inpatient psychiatric hospital, outpatient psychiatric clinics, group homes for teenagers, a teen parenting program, elementary, middle and high school as a school social worker and I even offered individual and marital therapy in my private practice. Her printed products include a journal for Christian teenage girls that uplifts and encourages them as they navigate everyday life situations. Additionally, she is releasing a series of children’s books based on real-life experiences of her daughters. Bio: Tracé Wilkins Francis’ second childhood dream was to own an established dance studio that she successfully accomplished for twelve years. After the birth of her son, she decided to focus more on her first dream of writing. Her ambitious drive and determination of starting a publishing company was inevitable. She served as one of the editors for an online women’s ministry, RMI. She has completed a chapter book for middle grade readers. Tracé is also an assistant producer for several projects under her husband’s film and theater company, JetFarm Pictures. They are in production for a Christmas musical of the Jo Jo Bean book series, which will be opening in December 2016. Tracé will have a role alongside Michael in an upcoming movie “John” – The Real Life Story of John Henry. They currently live in Long Island, New York with their son Joseph aka “Jo Jo Bean”, her inspiration behind her book series. Bio: Sandy Lanton, a former teacher, earned a BA in Psychology and an MS in Early Childhood Education from Queens College. She has studied writing at the Vassar Institute for Publishing and Writing, Hofstra University and privately with the late Pam Conrad. In addition to the SCBWI Conferences, she has attended Rutger’s On-On-One and the Highlights Foundation Workshop at Chautauqua. She is the author of several picture books: LOTS OF LATKES, the Sydney Taylor Award Winning DADDY’S CHAIR and STILL A FAMILY, A YOUNG CHILD’S STORY ABOUT DIVORCE. Her rhyming story, BUTTER, BUTTER AND MORE BUTTER was a finalist in the AMERICAN BOOK COOPERATIVE Children’s Book Competition. Her chapter book, THE HAPPY HACKERS is part of a reading program used in many schools. A native Long Islander, Samantha McEachin-Ifill is an author/illustrator and the owner of Demi Ink Pres s. Samantha holds a Juris Doctorate in Law from Hofstra University, a B.A. in English Literature from the State University of New York at Stony Brook and is a Half Hollow Hills High School West alumna. For the past 12 years, she has been employed by the Suffolk County Attorney’s Office. She is also a member of the Society of Children’s Book Writers and Illustrators (SCBWI) and the Long Island Children’s Writers and Illustrators (LICWI). For more about “Willow the Vam-PIE-her”, visit the website at www.vampieher.com , follow Willow on Twitter @iamvampieher, or like Willow’s Facebook fan page at www.facebook.com/WillowCoffington . For further information, please contact: Samantha McEachin-Ifill, Publisher, 631.624.2537, demiinkpress@gmail.com. Have you ever met a vam-PIE-her? No? Well, meet Willow. She is a spunky, but not spooky, little vampire that is not like the others. Follow Willow on her magical journey from vampire to vam-PIE-her. A scented FANG-TASTIC story about friendship and learning that standing out is way cooler than fitting in! And there is plenty of pie too! For a review copy of Willow the Vam-PIE-her (2nd Edition) or an interview with Samantha McEachinIfill, please contact the author/illustrator at demiinkpress@gmail.com. When requesting a review copy, please provide street address. Bio: Corey Pegues is a Queens New York native, is a retired NYPD Executive as well as a Author, Motivational Speaker, Community Leader, and Expert on police related topics. His career spans over two decades and speaks for itself. book is a memoir of his life which takes the reader on a rollercoaster that will have you going through several emotions as he details his story of growing up a drug dealer to becoming an executive in the biggest police department in the country. Bio: Kyle Horne is a writer and artist from Deer Park, NY. He has authored several books including The Lost Conjurer and Mrs. Smith. Bio: Marie Jirlande Fenelon is a teacher in Long Island living in New York. She is the author of two children books, one in English and one in French. Both books are being translated in Haitian Creole.